6 Steps To Beat The January Blues! So-called January blues threatening to put a damper on your new year diet? Don’t panic! Here, we share our top tips for staying positive and focused on your weight loss goals this January. The half empty boxes of treats sit sadly in the corner… the recycling boxes clink as the remains of the decadent festive season are dragged away… the letterbox flaps as December’s credit card bill falls arrives! You had a fantastic time but now is the time to step forward, breathe deeply and get stronger and wiser as you embrace the brand new you this January. 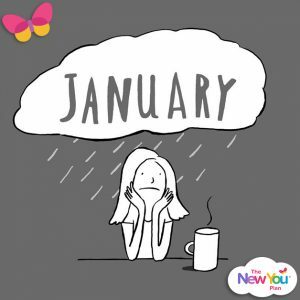 Call it the ‘January Blues’ or ‘Blahs’ or simply ‘Seasonal sadness’, around this time of year, we begin to feel our mood drastically sinking. We feel exhausted and sluggish, moping from one thing to the next. However, there is a psychological reason for these so-called January blues! We’re back to work, the days are shorter and colder and we’re spending more time indoors and in turn become less active. Just to add to all of this, our bodies produce more melatonin, which makes us feel lethargic and sleepy. Plus, over indulgence of sugary foods during the holidays leads to a spike in glucose levels followed by a crash of exhaustion. Phew! It’s no wonder so many people struggle to stay focused and strong while on their new year diet. 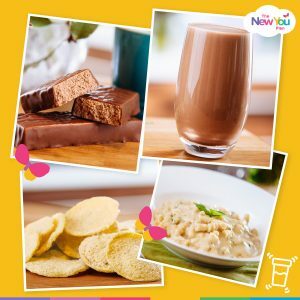 Here, at The New You Plan, we are on a mission to help make January amazing! We know only too well that getting your diet off to the best possible start is key in setting yourself up for success. Instead of feeling sad that it’s January, yes this time for a fresh start. 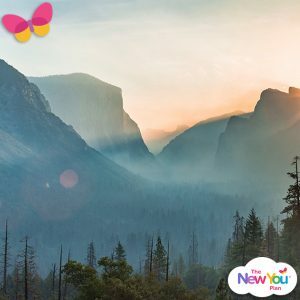 A new year gives us the opportunity to wipe the slate clean, forget about the past and move forward in a positive way, making simple changes which will have the biggest impact on our overall lifestyle and wellbeing. Remember, each new day is a new opportunity. Take each day, then each week and each month at a time. 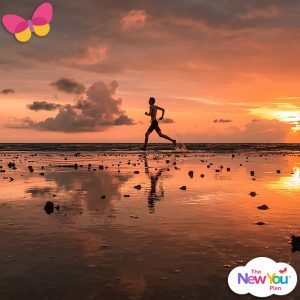 Before you know if, your new habits will be firmly in place and you’ll be feeling happier, fitter and healthier and glad that you kicked January off the way you did! Take a short walk each day or go to a yoga class. Workout DVDs are another great option. If you’re not sure what you like, try a variety of activities that appeal to you. Pay attention to which activities boost your mood and energy levels and vow to do more of that! It doesn’t need to be anything strenuous either. Just enough to get the body moving. A 10 minute walk or a gentle yoga class can have a truly positive impact on our health and mood. However much we crave starchy foods in the winter, protein is what your body requires. Protein doesn’t spike your sugar levels, it leaves you feeling satisfied, less irritable and sluggish than simple carbohydrates or sugars. Thankfully, you don’t need to worry about how much protein you are consuming as we’ve done all the hard work for you. Our meals are carefully balanced in nutrients and high in protein so that you can lose weight without even thinking about it. Sunshine! We require around 20 minutes of sunshine a day to keep our vitamin D levels topped up. This can be achieved with a walk in the winter sun, sitting by a sunny window or even a light box which produces artificial light. 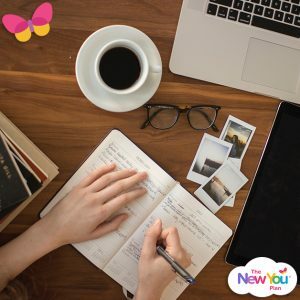 Why not start the day sitting by the window and filling in your New You Plan Magical Month Journal? This comes FREE with our 6 & 12 week New Year New You Bundles. 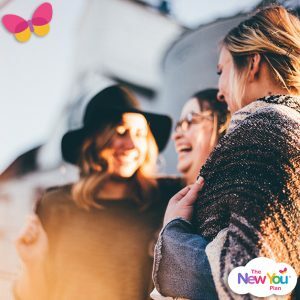 Oxytocin, serotonin and dopamine are all happy hormones that will improve your mood. 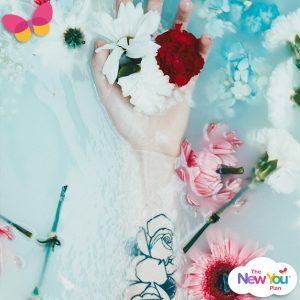 Give yourself a little pamper; this could be in the form of a relaxing bath, lighting candles or even having a good hug with a loved one. Remember to reward your progress. Indulging in a little me time is our favourite way to do so. This is key! We know it’s cold out there and probably the last thing you want to do is get out of those cosy PJs but try to arrange regular contact with friends and family. This is good for your mental health! Or, why not join us in Secret Slimmers? This amazing group is packed full of so many positive, inspiring and motivating people, all on the same journey together. You might even make new friends along the way. This could be anything from writing a journal, joining a gym or making jewellery. The important thing is that you have something to look forward to and concentrate on. This will keep your mind focused on something else, rather than food and eating, so it’s the perfect way to detox. A final thought for you: This is the year you will be stronger, braver, kinder and unstoppable. This year you will be fierce!